Turkey has issued arrest warrants for Kurdish fighters in Iraq and Syria alleging that they took part in planning and executing a car bomb explosion that killed around 29 people in Ankara at the beginning of the year. The arrest warrant by a local court targets 48 people including the Kurdistan Workers’ Party’s (PKK) Zübeyir Aydar and Remzi Kartal and the head of the Syrian based Democratic Union Party (PYD), Salih Muslim as well as other prominent leaders. The attack dates back to 17 February and its main target were military service vehicles that were passing by but most of the dead were civilians. Turkey blamed the PYD and its military wing, the People’s Protection Units (YPG) for the bombing. 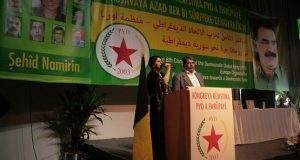 PYD is a Syrian based Kurdish group that has gained prominence in the fight against ISIS due to significant contribution of the YPG in repelling the extremist group. However, Turkey considers the group as a terrorist organization and a threat to its national security. At the beginning of the month, Turkey arrested several senior officials of pro-Kurdish Peoples’ Democratic Party (HDP) stating that they were being investigated. The move led to a boycott of parliamentary sessions by the party which announced on Tuesday that it will beginning attending sessions without providing further explanations. Ankara has embarked on a large scale crackdown of suspects and sympathizers of Fethullah Gulen but it has been criticized for not respecting Human rights during the process. Critics allege that the failed plot is being used as a venture to pursue its fight against the Kurdish armed groups. Written by: Peter Mulvany on November 22, 2016. Posted by Peter Mulvany on Nov 22 2016. Filed under Headlines, World News. You can follow any responses to this entry through the RSS 2.0. Both comments and pings are currently closed.